April 30th is the last day to pledge to save water in the National Mayor’s Challenge for Water Conservation. Currently, Tucson is in 2nd place for our size and region. If we take 1st place, we’ll be entered into a drawing for a pocket park landscape makeover, including a water-smart irrigation system. Tucsonans who pledge will be entered into prize drawings too, including for the grand prize: a Toyota Prius. Take the pledge at mywaterpledge.com and help Tucson retake the lead! 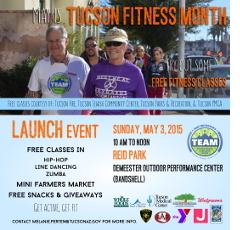 May is Tucson Fitness Month, with free fitness classes offered at various locations every day from May 3rd to May 30th. Come to our launch event Sunday, May 3rd from 10 a.m. to noon and take a free class in hip-hop, line dancing, zumba – or all three. Enjoy free snacks and giveaways courtesy of event sponsors Whole Foods, Walgreens, Tucson Medical Center, Southern Arizona Roadrunners, the City of Tucson, and Arizona Party Rental. 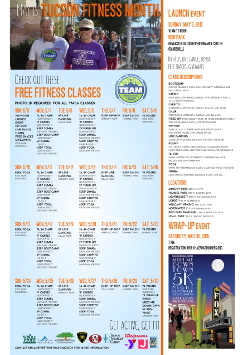 Pick up a calendar for the month’s free classes (or print one out here) and get active, get fit! Remember to bring a photo ID to all Y locations. Health and wellness is important and, whatever our situation, we can take steps to improve both – literally – by moving. That’s why I started Tucson Moves a Million Miles and now, Tucson Fitness Month. Many thanks to the instructors, courtesy of the Southern Arizona YMCA, the Tucson Fire and Parks & Recreation Departments, and the Tucson Jewish Community Center. Check out some free classes – you’re sure to find something you like. Visit the Mayor’s website and follow him on Facebook or Twitter.